This Pineapple Upside Down Cake Cocktail is dessert in drink form. Frothy and sweet, with just the right amount of boozy goodness from Pearl Vodka, it’s fantastic for summer! Let’s get real – it’s been a really long time since I’ve had a cocktail. Between being pregnant and being the sole source of nutrition for my baby girl for her first year, it’s been forever since I imbibed. So when I decided to finally ease back into having grown-up drinks, I needed to make it special. Something to wow my palate as much as my favorite desserts do. This Pineapple Upside Down Cake Cocktail? It totally ticks all the boxes for one amazing way to end a self-imposed dry spell. 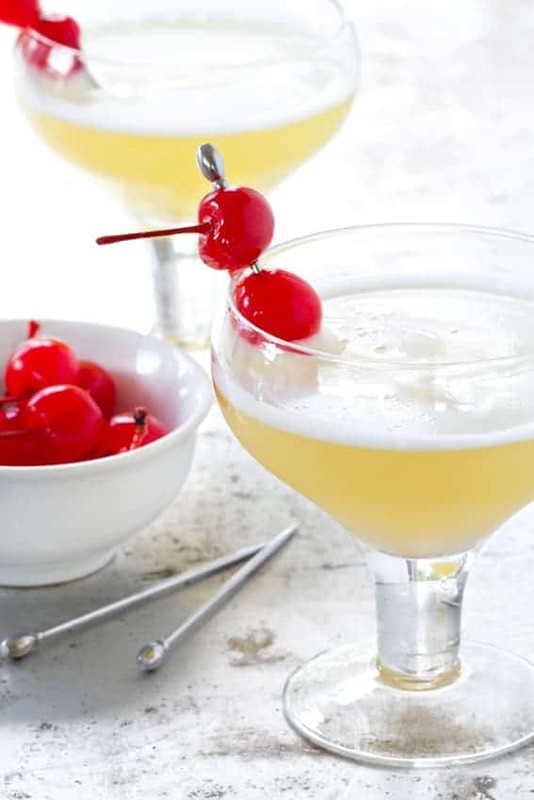 Sweet pineapple juice and Pearl Vanilla Bean vodka are combined with just a little bit of Maraschino cherry liqueur and a super frothy pasteurized egg white. While you can skip the egg white if you want to and still have a great drink, I really like the extra richness it provides – making this cocktail feel truly dessert-like. Using a pasteurized egg white makes it pretty safe to do so. 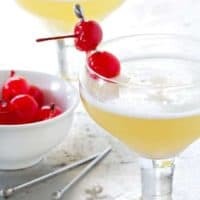 Using egg whites in cocktails is actually a pretty common custom that’s been around for over a century – but one that I wasn’t truly aware of until I spotted a frothy cocktail on the menu of a restaurant in Cleveland. Egg whites create an unbeatable foam, which to me, makes it pretty fantastic here. Now let’s talk about that vodka. 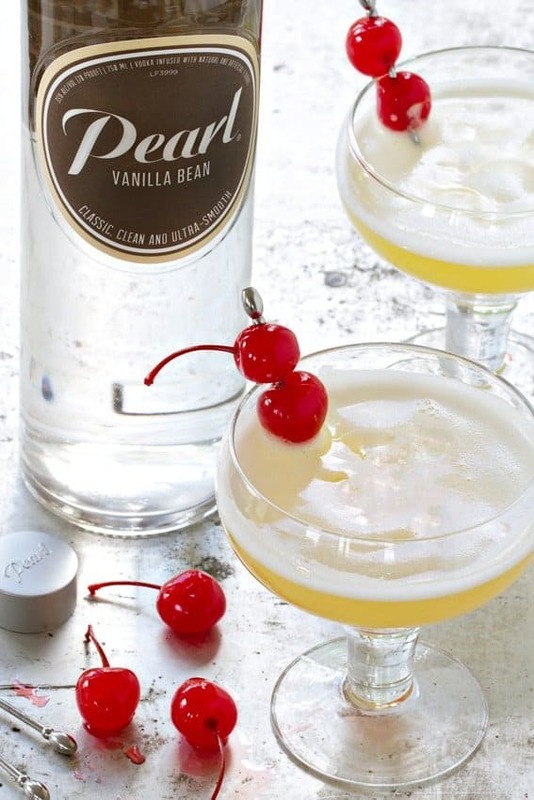 Pearl Vanilla Bean Vodka is just perfectly spiced, and would be amazing in quite a few cocktails – everything from a Cosmo to White Russian. That vanilla flavor is going to add a boost of sweetness that will round-out any cocktail you add it to. I’m also thinking it’d be pretty fantastic in that vodka pie crust recipe that makes the rounds every few years – the extra vanilla flavor would make that pie crust extra special. Pearl Vanilla Bean Vodka is brand new for summer, and will be SO good in all of your summery cocktails. Hop over to Pearl Vodka’s website for a handy locator to find it near you. Whatever you do, don’t forget that Maraschino cherry on top! Just like a sundae, this cocktail wouldn’t be complete without it. This is a sponsored post on behalf of Pearl Vodka. Thank you for continuing to support the brands that make My Baking Addiction possible. Fill a cocktail shaker with ice. 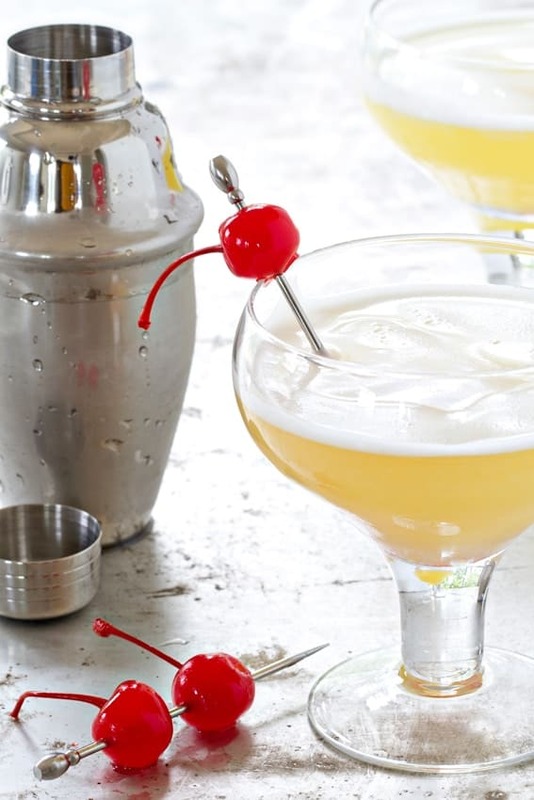 Add Pearl Vanilla Bean Vodka, pineapple juice, maraschino liqueur and egg white (if using). Shake rhythmically for 30 seconds. Strain into coupe glass and garnish with a maraschino cherry. This sounds crazy good for summer! Thanks so much! I think it will be the perfect summer sipper. Thanks for stopping by.